You’ve watched them rise. Now watch them fall! 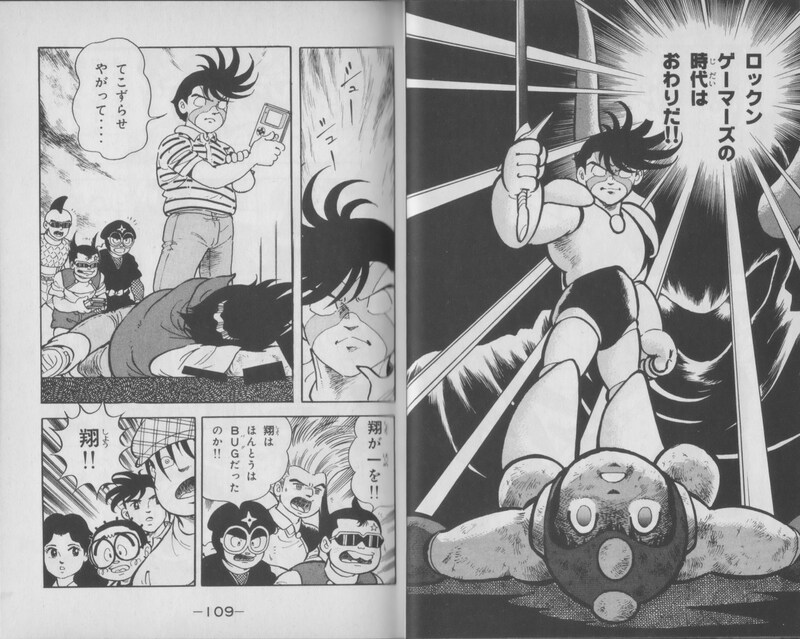 The chilling conclusion to Rock’N Game Boy‘s adventures in Rockman World. 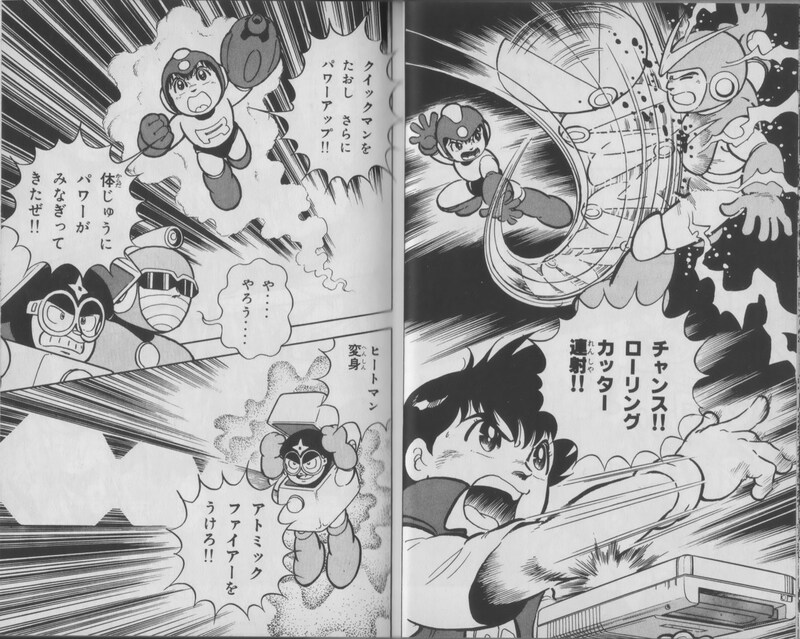 Hajime-Rockman and Bit Bender-Flashman savagely tear into one another. Bruised and bloodied (that’s right, bloodied!) 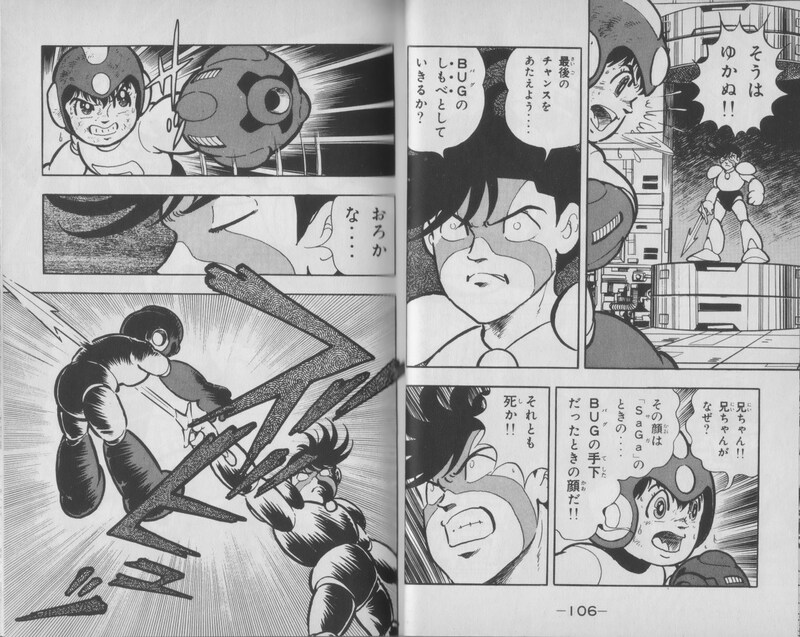 but not yet beaten, Hajime realizes that Flashman has just too much power at close range, and that he’ll have to predict his movements and attack from afar. I guess that’s… sort of like the games? Caught off guard, Flash-in-the-pan Man gets his lights put out. Hajime acquires the Time Stopper just in time for the next boss. Up till now we’ve seen him talk and boss the others around, but we haven’t seen the Bit Bender’s leader actually do anything. 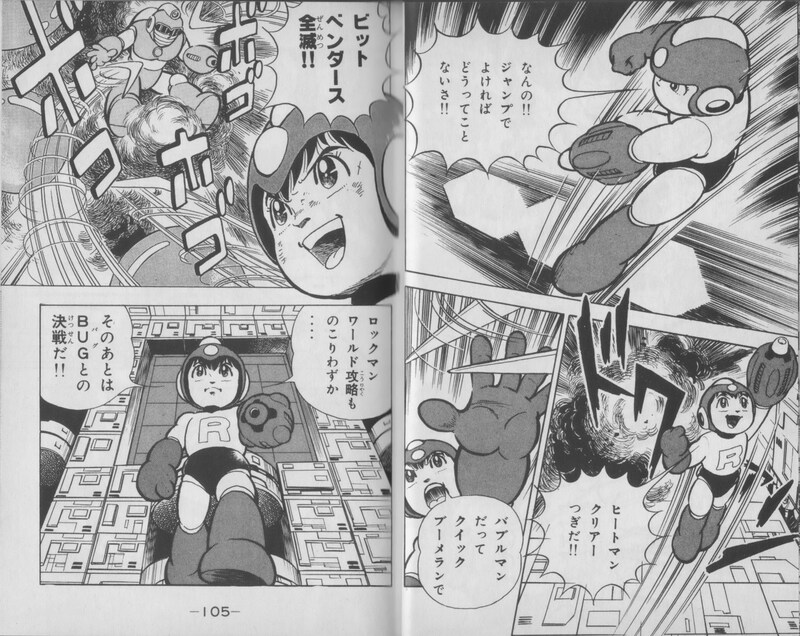 All that is about to change, because he’s overlapped the form of Quickman. Between his unparalleled speed and the ability to shrug off pretty much all of Hajime’s attacks, it seems certain that the Bit Bender has the upper hand. Tell me you didn’t see that coming. 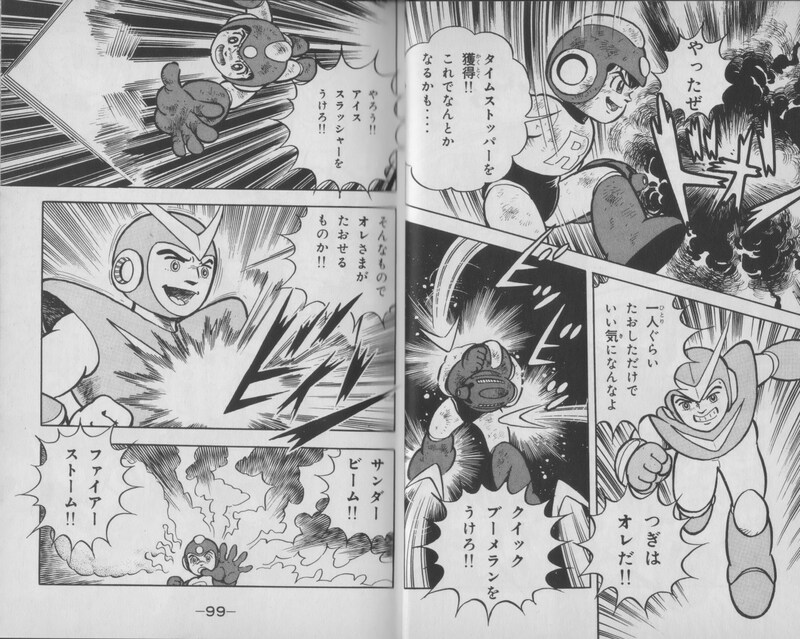 Frozen in his tracks, Quickman is defenseless against Hajime’s Rolling Cutter attack. Departing once again from the game physics, where you’re not permitted to change weapon while Time Stopper is going, much less have the enemy remain frozen afterward. 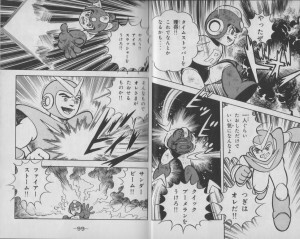 Also, the Rolling Cutter like the Metal Blade will deal absolutely no damage to Quickman at all in the game, but here it will gut him like a trout. The other Bit Benders are getting pretty freaked out by now. From here on, game physics be damned. Heatman launches himself full force at Hajime, but Rock’n Rockman dodges with a jump and he’s Quick-ly defeated (even without the Bubble Lead). Putting up even less of a fight, Bubbleman gets popped soon after. With all of the so-called Big 4 of gaming thoroughly broken, Hajime plans to wrap up this game and get back to squashing BUG under his heel. But defeating the four bosses unlocks a fifth: and this boss is being controlled by none other than his own brother! Just as BAL predicted, Shou could not resist the brainwashing signal this close to the source. Hajime is distraught to see his brother once again under BUG’s control, but he knows from painful past experience that there’s no reasoning with him in that state. There’s only one way to save Shou now: Hajime must defeat him in battle! Easier said than done. Shou-Enker readies his spear, which is more of a sword-thing here, and offers one final ultimatum. Hajime raises his buster in reply. There will be no backing down now. This duel will decide their contest, their mission, the fate of Shou and all the Rock’n Gamers. The whole world is hanging in the balance. Everyone is shocked by this twisted turn of events, but it is the forces of evil that are the first to recover. In the aftermath, the remaining Rock’n Gamers are hit with knock-out gas and imprisoned. Hajime is brought to BUG’s inner sanctum to become their next mind control subject. There he will play Super Famicom games with the rest of BUG’s elite forces in preparation to become their ultimate soldier and spearhead the conquest of Earth. With both Shou and Hajime on their side, the Earth is now doomed. And of course, you’re right. Later on it is revealed that Hajime was only pretending to be brainwashed to reach a position of power where he could foil BUG’s schemes once and for all! And aiding him in this ruse is none other than BUG’s own supercomputer, BAL! After watching the Rock’n Gamers defeat BUG’s forces time after time, BAL concluded that it is truly they and not BUG who had the real power and the right to change the world. In the end, Hajime saves the world by winning a game of Bombliss that causes all of the weapons BUG has deployed around the globe to harmlessly self-destruct. The Rock’n Gamers return to their normal lives, where no one knows how these young heroes brought the world back from the very brink of destruction. Now that BUG is defeated, the gang prepares to tackle their next big challenges: their parents, school, and of course, the latest new video games! 3 Comments to "ROCK’N ENDGAME"
Wait a minute… the last two games are for SNES and NES? Sometimes what happens in the game zone happens in real life, but only if it’s relevant to the plot. It happens a lot more often with Hajime and Shou, but that could be to do with their higher-than-most Rock’n Spirits. Then again, maybe Shou did just go up and clock him in the back of the head with his Game Boy. That thing was a brick! 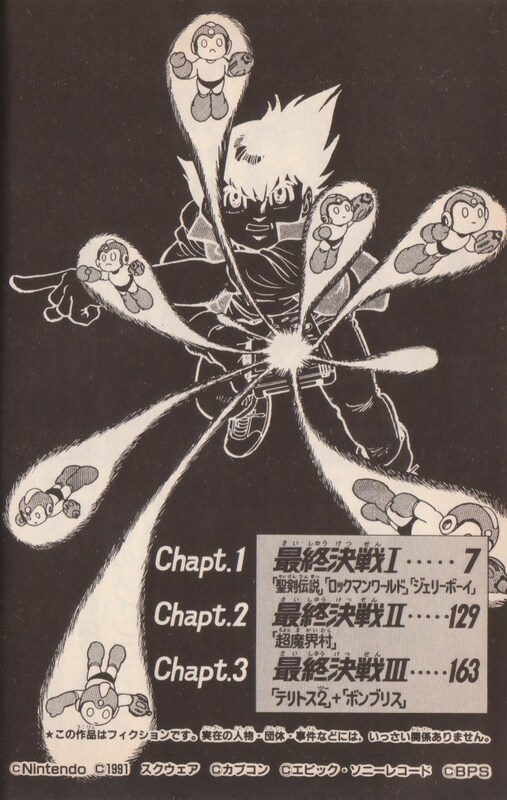 They did occasionally throw in non-game boy games throughout the manga, but towards the end they did it a lot. Maybe because there wasn’t going to be a Super Famicom Fuuunji? 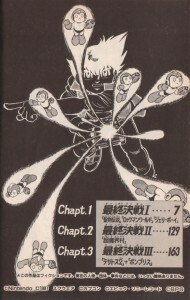 Bombiss is worthy as a finale though, since Tetris was the first game featured in the series (makes sense, since it was one of the first and biggest name titles on the Game Boy). Plus the background scenes have such an international flair that it blends pretty well with the idea of blowing up evil around the world. They did do some interesting stuff with game premises sometimes. I… I’m going to miss writing about this series.